I am residing at Chennai, India. For many months I had problem with mosquitos, they came in hundreds. I was not able to sleep well at night. I even found Mosquito Repellent software in the internet, funny isn't? 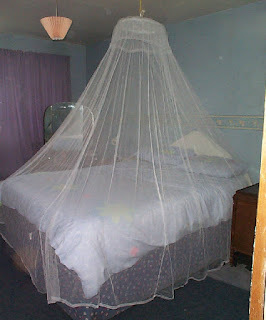 But later found out that the only best way to escape from mosquitos at night is to use Mosquito Nets. Yes after trying all the above I tried Mosquito Net, it is just Rs 200. No smoke from Coils, no smell from Mosquito Repellents. Now I can sleep well at night.